Andhra Pradesh State Police Recruitment Board (APSLPRB) is the police recruitment board that carries out the police posts in the state of Andhra Pradesh. The organization annually announces various posts to recruit the suitable aspirants into police jobs in AP state. The organization announced 3471 posts this year. This year APSLPRB announced various posts of Sub-inspector, Deputy Jailor, Station Fire Officers, Constable, Warder, Jailor, Asst Public Prosecutor, RSI Posts. Aspirants wishing to become police constable in the state of AP has applied from 5th November and 24th November. The department received a large number of applications from the eligible and interested aspirants this year. Hopefuls need to qualify the AP Police Constable written test (preliminary and Mains examination), Physical Eligibility Test, Physical Standards Test, and interview rounds to get the AP Police Constable posts. Previously, the competitors will be having the written test in the month of December. Andhra Pradesh State Police Recruitment Board (APSLPRB) is going to host the police constable written test on 16th December. This year a larger number of candidates are going to take part in the written test round for AP Police Constable, SI posts. Hence, the competitors must prepare well to crack the written test. The APSLPRB is going to conduct the preliminary examination for Postcodes: 11-16 on 16th December Paper-I from 10.00 AM to 01.00 PM (3 hours) and Paper-II from 02.30 PM to 05.30 PM on the same day. The APSLPRB is going to organize the preliminary written test for Postcodes: 21- 26 on 6th January 2019 from 10 am to 1 pm. All the applicants who have applied for the APSLPRB Police Constable and other posts have to attend the preliminary examination as per the scheduled dates. The organization will conduct the examinations as per the postcodes and the exam slots. As per recent reports, more than 3 lakh aspirants are going to compete for APSLPRB Police Constable, SI, and other posts this year. Hence the aspirants competing for the AP Police Constable, SI, RSI, Fireman, Warder, and other posts must focus well to clear the written test round. Candidates have to succeed the test with good merit to get filtered for the next rounds of selection process. 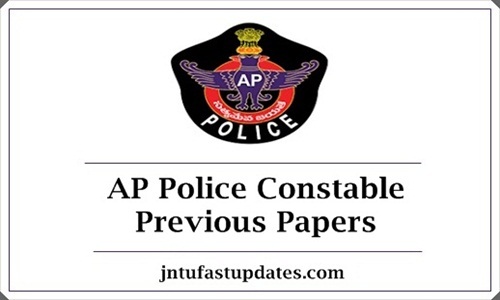 Candidates who are going to compete for 16th December 2018 examination and 6th January 2019 examination can download AP Police Constable previous papers to prepare well for the contending test. By downloading AP Police Constable Old papers, the competitors can get the idea regarding the exam pattern, sort of questions asked in the examination, ability to answer the questions, time taking to answer the questions, and other aspects. Preparing old papers/previous papers will give a complete understanding of the examination and hence the candidates can clear the AP Police Constable examination with a good score. So, for the aspirants here we provided the direct links to download AP Constable previous papers. Just by clicking on the links, hopefuls can download the previous question papers with solutions.